Vladimir Putin is the current President of Russia, and won reelection for his second consecutive term – fourth overall – in March 2018. Bashar Hafez al-Assad is the 19th President of Syria, in office since July 2017. Both Putin and Assad are known for their authoritarian rule and both continue to be on the front page of newspapers all over the world because of their involvement and role in the Syrian conflict, which has now entered its seventh year. Assad and Putin are two strong personalities and their leadership styles have some aspects in common – mainly because of their strong control over the military and the entire government –, but their history, their political views and their background are rather different. The two rulers have developed a strong alliance during the years, with Putin (and Russia) being among the few supporters of the Syrian government as western forces and international organizations push for the removal of Assad from office in order to bring to an end the Syrian conflict, one of the deadliest wars of the last decade. 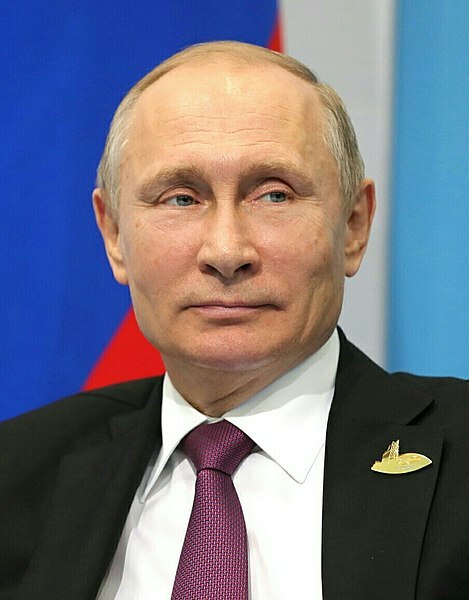 Vladimir Putin is the serving president of Russia, in office since 7 May 2012, reelected for the second consecutive term in March 2018, after having previously served as president from 2000 to 2008 for two consecutive mandates. Putin was born in Leningrad (now St. Petersburg), in Russia, on 7 October 1952; he was married to Lyudmila Putin from 1983 to 2014 and has two daughters, Maria and Yekaterina. Putin graduated from the Leningrad State University with a degree in law in 1975, and served as intelligence officer in the KGB – the Russian Committee for State Security – before turning to politics. In 1975, upon graduation, joined the KGB as part of the staff of the First Chief Directorate of Foreign Intelligence and served in Leningrad but also in Dresden, Germany. He started turning towards the political sphere in 1991, when he became the advisor of Anatoly Sobchak, who won the elections that year, becoming mayor of Leningrad. In 1997, Putin was named deputy chief administrator of the Kremlin – the Russian national government – under president Boris Yeltsin, and in 1999 was appointed as Prime Minister of Russia, as well as Chief of the Federal Security Service. On 31 December 1999, president Yeltsin was forced to step down amid scandals and Putin became the acting president of Russia, until he was formally elected president and sworn in few months later in March 2000. Bashar Hafez al-Assad is the serving president of Syria, holding office since July 2000, after having been reelected in 2007 and 2014. Assad was born in Damascus, the Syrian capital, where he currently lives with his wife, Asma, and their three children – Karim, Zein and Afez. 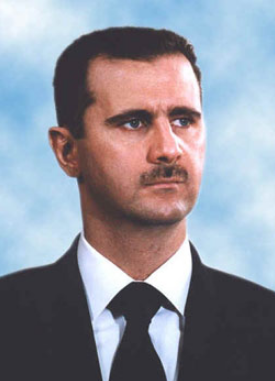 Second son of the 18th president of Syria, Hafez al-Assad, Bashar graduated from medical school in Damascus in 1988 and specialized in ophthalmology at the Western Eye Hospital in London, after having served in the Syrian Army as doctor for four years. In 1994, Assad was forced to return to Syria to fulfill his role as heir apparent after his older brother, Bassel, died in a car crash. Once in Syria, he entered the military academy and became colonel of the Syrian army in 1999. On June 10, 2000, his father died of heart attack after 29 years in office, and Bashar was elected president of Syria with 99.7% of the votes. He was later reelected in 2007 with 97.6% of votes and in 2014 with 88.7% of votes. The 2014 elections were contested by the Syrian opposition and western governments and organizations, which denounced the role of Assad in the Syrian civil conflict that broke out in 2011. Since the beginning of the civil war, Assad has been accused by the UN and western power of having committed war crimes, and the EU, the United States and the majority of the Arab League called for his resignation. Putin and Assad have two different personalities and different leadership styles, but there are some similar aspects in their domestic and foreign policies. Military background: both Putin and Assad have a military background and the military style is evident in their leadership style. Putin served in the KGB while Assad was a doctor in the Syrian army. Both are current in charge of their countries’ military and army and both are often considered authoritarian leaders with a clear military influence in their leadership style. 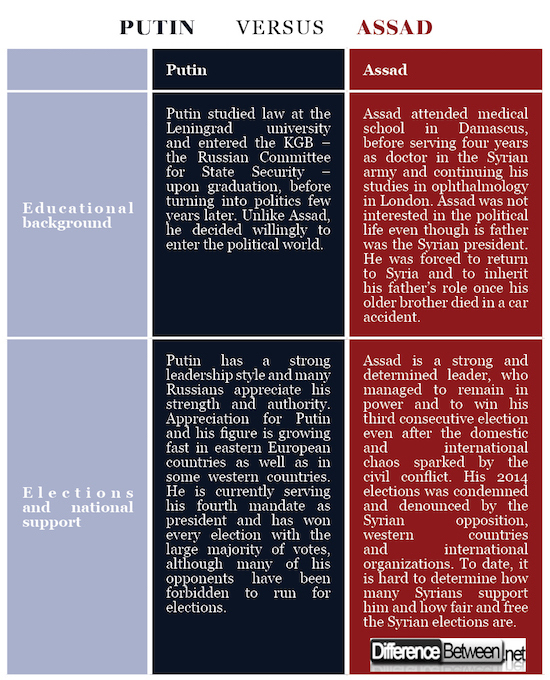 Influence: while both Putin and Assad are strong personalities in their countries and their region, Putin has a far larger influence on the international and global scale. Indeed, Russia is one of the largest countries in the world, is one of the permanent five members of the UN Security Council and has the power of vetoing or supporting UN resolutions. Therefore, Putin’s (and Russia’s) role on the global scale is more significant than Assad’s, even though the seven-year-long civil conflict has increased Syria’s importance on the international scene. Building on the differences highlighted in the previous section, we can identify few other aspects that differentiate the two leaders. Putin is the serving president of Russia while Assad is the president of Syria. The two have developed a strong alliance since the beginning of the Syrian civil conflict, and Putin is one of the strongest supporters of the Syrian government against western interference. Both are strong and authoritarian leaders and both have conflicting relationships with the west. Assad has been accused of committing war crimes during the Syrian conflict – including using chemical weapons against the Syrian population – while Putin has been condemned for his interference in Ukraine and Syria, as well as for his strict control and censorship of human rights and media organizations. Giulia Squadrin. "Difference Between Putin and Assad." DifferenceBetween.net. May 8, 2018 < http://www.differencebetween.net/miscellaneous/politics/difference-between-putin-and-assad/ >. Hill, Fiona. "The real reason Putin supports Assad." Foreign Affairs 25 (2013). Shiraev, Eric, and Vladislav Zubok. Anti-Americanism in Russia: From Stalin to Putin. Palgrave Macmillan, 2000. Zisser, Eyal. "Does Bashar al-Assad Rule Syria?." Middle East Quarterly (2003).